The 24" L x 48" W work table has 9 height adjustments from 36" to 48". The wrap around backstop keeps items from falling behind the work surface. 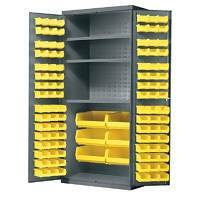 Standard with 2 steel shelves, the middle shelf is sloped for easy access to stored items. The work table comes with 5" x 2" bolted on polyurethane casters and two swivel casters with total lock brakes. Optional accessory package that includes, (1) rail kit, (12) 30220 AkroBins, and (12) 30230 AkroBins are available. Industrial-grade work table with steel-reinforced oak deck top. • Size: 24"L x 48"W x 36"H.
• Two steel drawers – 15 1 ⁄ 2"W x 5 1 ⁄ 2"H x 16 1 ⁄ 2"D.
soft rubber casters;5" x 1 1 ⁄ 4". Total lock brakes on swivel casters. • Frame colors: Red, Gray or Blue. Specify frame color when ordering. • 24"L x 48"W work area with 9 adjustable height settings from 36" x 48". two rigid, two swivel with total lock brakes. items from falling behind work table. • Blue, Red, or Gray enamel finish. • 24" x 48" Adjustable height work table. • 1 - Rail Kit. • 24 - Small AkroBins (Model 30220). • 12 - Medium AkroBins (Model 30230). Please specify frame color and bin color.